Two thousand years ago, a fire humbly and meekly exploded into our reality. That fire was Christ. Take the Journey Toward Perfection and be transformed. You will undergo a metamorphosis. You will become the butterfly that God always meant for you to be. A Journey Toward Perfection reveals a path toward developing an intimate experiential relationship with God. It is an in-depth study of the attributes recorded in the Beatitudes of Matthew 5. These are the attributes God bestowed upon us when He created us in His image. They are the traits necessary to love others as God loves us. When Christ invited us to deny ourselves, take up our crosses and follow Him, He asked us to follow His example. He encouraged us to take a journey toward perfection, toward a loving God who extends His open arms to us even as Christ’s arms were extended on the cross. He challenged us to develop characteristics, such as humility, meekness and purity of heart. If we accept His invitation, we will embark on a life-changing journey. We will find ourselves walking in the footsteps of Christ. We will experience what He experienced and see life through His eyes. We will learn how profound His love for us truly is. We will begin to develop attributes of Christ that will sustain us through the many trials and tribulations of our lives. We will experience God’s true presence in our lives. A Journey Toward Perfection - Deny Yourself, Take Up Your Cross, And Follow Me: The Beatitudes as a Road Map for Our Journey through Life by Helen Kamenos is a beautiful book about how a person should strive to become one with Jesus. At a glance, you can tell that the author puts her heart and soul into her words and this book. The book focuses more on the Beatitudes of Matthew 5 and the attributes of Jesus described in them. The book takes a closer look at the attributes of God and how we can become much like Him, love people like He does, and be as pure as He is. Like the author says, it is a tall order to fulfill, but it is our duty to at least try. Our decisions have a direct impact on how we connect with Jesus and how they affect our lives. This book is about enduring, bearing your crosses, and wearing them like a crown. This is a guide for anyone who wants to connect with God and become one with Him. This book was written with a pure heart and soul. You can feel Helen Kamenos’ love for Jesus in her words and how much she wants everyone to feel as close to Him as she does. It was exciting to read her words because she was excited to tell us what she thought. I think this is the best way to write a book like this. It was a wonderful experience. I truly was blown away by A Journey Toward Perfection. Author Helen Kamenos is an Orthodox Christian and gives a truly stellar description of many tenets of their doctrine. It is very detailed and thorough. I very much enjoyed it because, as is true of many Christian books and especially the Bible, passages will seem to be written just for the reader. For example, things I have been thinking about in my daily life recently were referred to in the pages of this book. This may seem impossible to some people, but this is why the Bible is referred to as God's Living Word. It can speak to your situation and give biblical counsel. Each chapter starts with a Bible verse to illustrate its main points. It's a very good study tool and is also enjoyable reading in its own right. The author, Helen Kamenos, has chosen the subtitle The Beatitudes as a Road Map for Our Journey Through Life. This is a good analogy, because the Beatitudes, found in Matthew 5 and 6, contain the sermon on the mount which is a list of proper behaviors for Christians and the rewards inherent in those behaviors and beliefs. For instance, the meek shall inherit the earth. This one is often quoted as a reminder to refrain from anger and violence. It could even be used to guard against unwholesome talk and criticism. In the Bible, it says we are to submit to whatever authority is in place, such as the laws of our land or our bosses. By doing so, we become meek like Christ and consequently can inherit the earth. This book would be a great faith builder or a comfort if the reader is already familiar with the Bible. It would be a lovely gift for newlyweds or a student upon their confirmation, graduation, or other rite of passage. 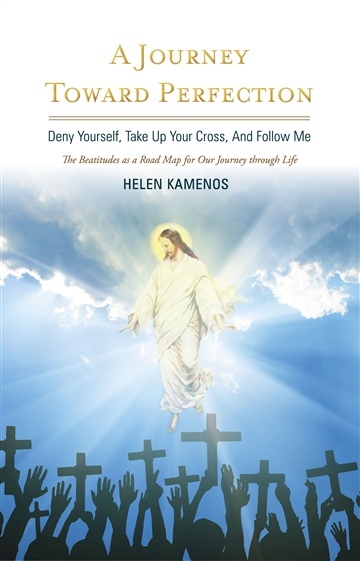 A Journey Toward Perfection: Deny Yourself, Take Up Your Cross, And Follow Me: The Beatitudes as a Road Map for Our Journey through Life by Helen Kamenos is an uplifting book for all those who seek the love of Christ. The book leads readers into a deeper relationship with God and reiterates the power of God’s love. The author exalts the virtues of Jesus Christ and makes Him the role model of divine love. Every Christian’s journey should be toward Christ and also toward an intimate relationship with Him and His divine love. Readers are encouraged and motivated through this book to follow in Christ’s footsteps to see their lives transformed and becoming more perfect in Christ. The book is motivating and encouraging to all Christian readers and speaks about how to experience the joy and peace of a virtuous life and true Christian living. The author quotes the most difficult teaching of Christ in the book: “Love your enemies, bless them that curse you, do good to them that hate you, and pray for them which despitefully use you, and persecute you.” (Matthew 5:44). The book is good for all Christians to look into themselves and see in what ways they can witness a transformation in their lives by believing in God. The author’s words are simple and easy to comprehend, and readers are taught that through a relationship with God they can reach a deeper relationship with Christ and see themselves change from a caterpillar into a butterfly. It has been years since I even thought about the Beatitudes. I grew up going to church in a small Methodist church outside Mobile, Alabama. I say Methodist but more precisely, it was African Methodist Episcopal Zion. A branch of the Methodist church created after the Civil War because white people, for the most part, did not want to attend church with the freed slaves. I often think about how different American history might be if the Christians of the era had simply embraced each other in the faith and just moved forward in Christian fellowship. The fact that this did not happen is a testament to the fact that the Church itself is on A Journey Toward Perfection. Let’s hope it gets there soon. It would change the world. An excellent explanation of how our thinking affects our choices, which affects the closeness of our relationship with God. The beatitudes show us how God thinks and as we understand that fully, by the power of the Holy Spirit, we come into increasing union and perfection. A clear guide for all seeking to have a closer walk with God.